Over 50,000 Downloads! Award-winning book by two-cancer survivor! TIME, the FREE SAMPLE BOOK. A genuine user’s guide to the meaning of life, the award-winning Manual For Living: REALITY (TIME), A User’s Guide to the Meaning of Life will change the way you see the world. Its straightforward guidance and practical wisdom will help you remain true to your path and purpose in life. Find True Fulfillment and Lasting Happiness, Overcome Your Fear Of Death, Learn How to Fully Experience Life, Reconnect with Your Inner Truth, and Discover Your True Purpose. I want to say thank you for writing this book! I am only a quarter of the way into it and it is really making a difference in my life! “They say” when you are ready the teacher will appear. I’m glad you did. – Kim G.
Seth David Chernoff is an award-winning author, two-time cancer survivor, marketing professional, and founder of multiple companies. His work has been featured previously in the Wall Street Journal, Chicago Tribune, San Francisco Chronicle, Popular Mechanics, Business Week, USA Today, on radio stations around the country, and ABC and PBS TV. 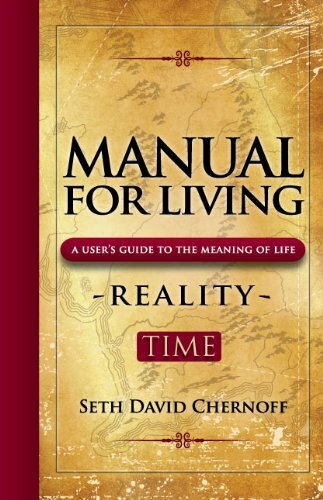 This is the Kindle version of Manual For Living: REALITY – TIME that you can also download and read on your computer and mobile phone. Kindle books are DRM protected and therefore, unlike ebooks that are in PDF or ePUB format, you cannot read this ebook without the official Kindle apps.